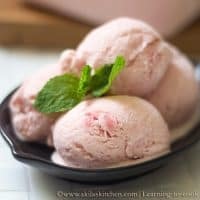 Eggless Strawberry ice cream is a flavor of ice cream made with strawberry, by blending fresh strawberries with cream, sugar and if needed with vanilla. 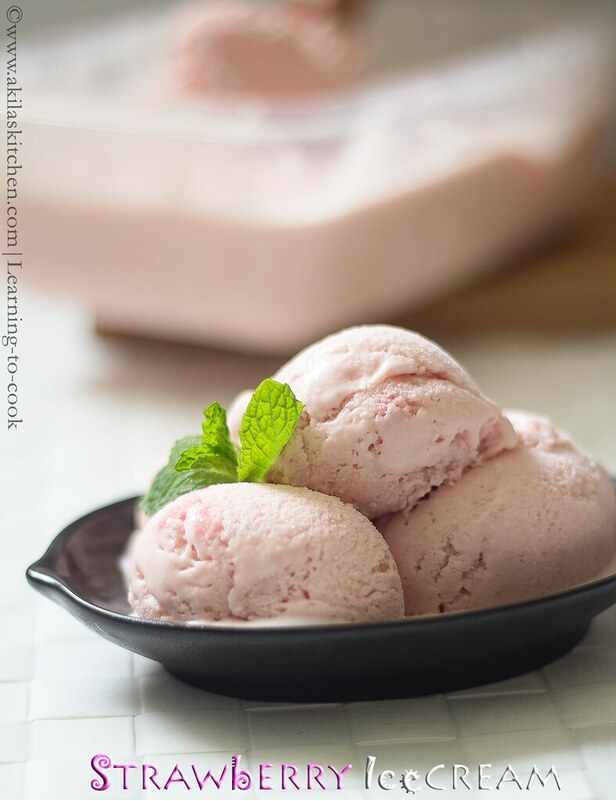 Here is the Eggless strawberry ice cream with step by step instructions for your easy learning and understanding. People used to make this, strawberry ice cream with egg and without egg. 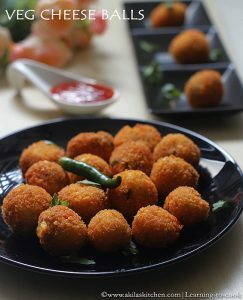 Here I have prepared them in eggless version as we do not eat in some days of the week. Though I have not added the egg, still it is creamy and tasty as we get in stores. 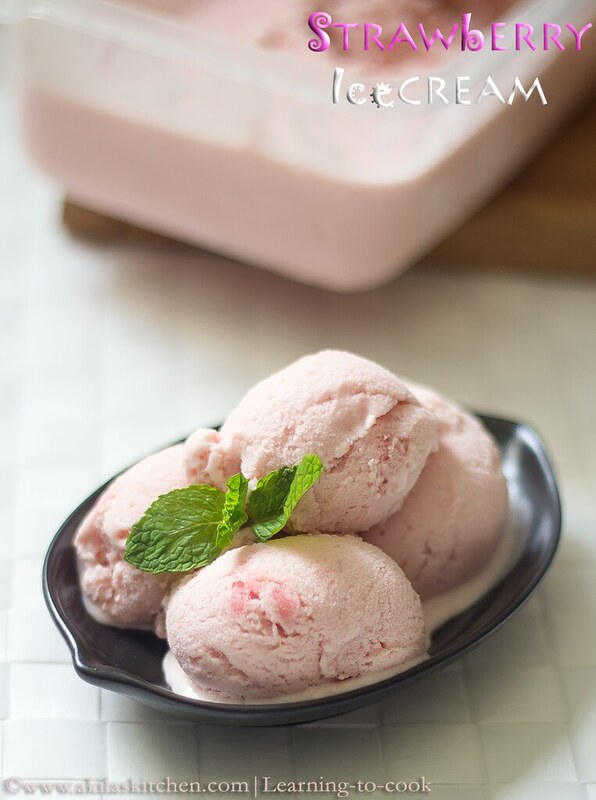 This strawberry icecream, I tried recently after the hit of mango ice cream recipe in our home. In this I added tiny bits of strawberry pieces to make it little crunchier. Since my strawberries were not so reddish, my ice cream came in pale pink color. I am planning to do more ice cream recipes with different fruits in the coming posts. I already have posted dry fruits strawberry ice cream with normal milk. 1. Wash the strawberries and keep 2 to 3 strawberries separately. The remaining berries, add in the food processor along with milk and the sugar. 2. Grind into smooth paste. Keep it ready. In another bowl, add the whipping cream and whip till it becomes thick. Do not whip it more. 3. Now add the strawberry mixture, to the whipping cream. Whip it just for 15 sec. or just stir using a spatula, until it is well combined. 4. Chop the strawberries into small bites, which you kept separately in step 1. Add this to the ice cream mixture. Give a stir. 5. Transfer the mixture to the freezer safe bowl and allow it to freeze for 2 to 3 hrs. Now take it out and again stir slowly and crush the ice if formed. Again freeze it for another 2 hrs. After 2 hrs, again crush again. Repeat the process for 3 to 4 times. 6. Allow to freeze for overnight or 8 hrs at least. 7. Serve the cool cool strawberry ice cream. 1. Adding the strawberries, is purely optional, but I love to add, as I liked the crunchy taste of strawberries in the ice cream. 2. Adjust the sugar level, based the sweetness of the strawberries. 3. You can see in my mango ice cream recipe for the whipping cream which i used. 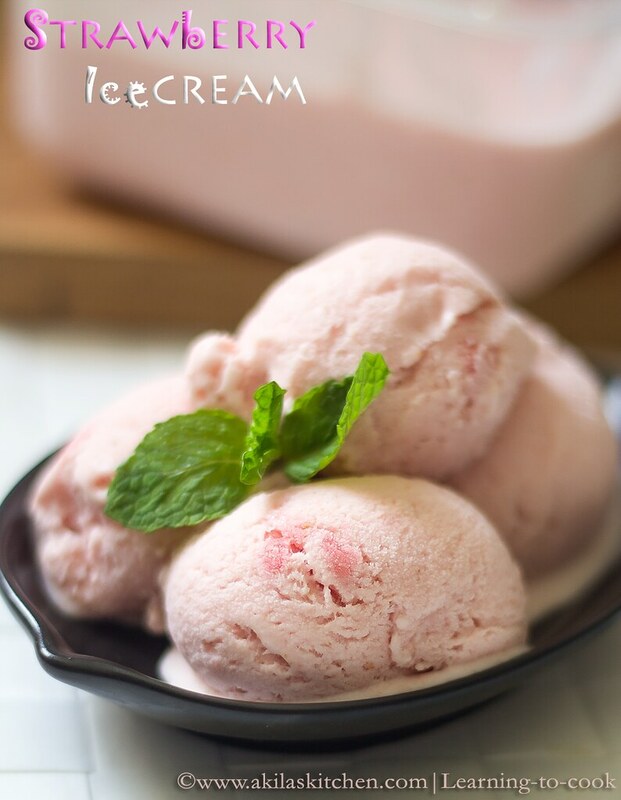 Eggless Strawberry ice cream is a flavor of ice cream made with strawberry, by blending fresh strawberries with cream, sugar and if needed with vanilla. 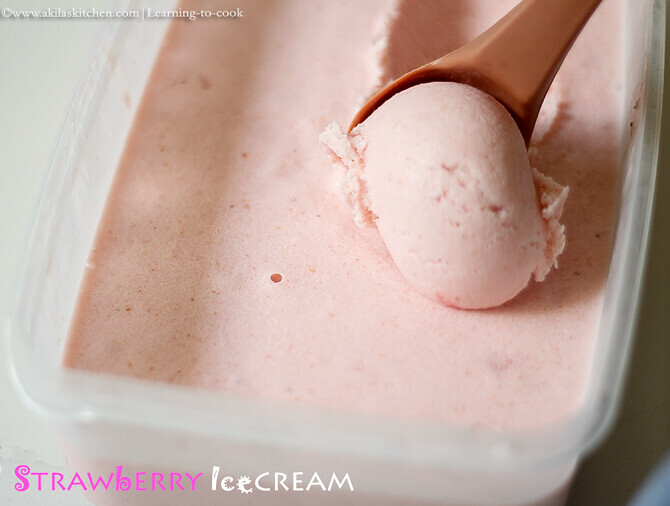 People used to make this, strawberry ice cream with egg and without egg. Here I have prepared them in eggless version as we do not eat in some days of the week. Though I have not added the egg, still it is creamy and tasty as we get in stores. Wash the strawberries and keep 2 to 3 strawberries separately. The remaining berries, add in the food processor along with milk and the sugar. Grind into smooth paste. Keep it ready. In another bowl, add the whipping cream and whip till it becomes thick. Do not whip it more. Now add the strawberry mixture, to the whipping cream. Whip it just for 15 sec. or just stir using a spatula, until it is well combined. Chop the strawberries into small bites, which you kept separately in step 1. Add this to the ice cream mixture. Give a stir. Transfer the mixture to the freezer safe bowl and allow it to freeze for 2 to 3 hrs. Now take it out and again stir slowly and crush the ice if formed. Again freeze it for another 2 hrs. After 2 hrs, again crush again. Repeat the process for 3 to 4 times. Allow to freeze for overnight or 8 hrs at least. Serve the cool cool strawberry ice cream. Adding the strawberries, is purely optional, but I love to add, as I liked the crunchy taste of strawberries in the ice cream. Adjust the sugar level, based the sweetness of the strawberries. You can see in my mango ice cream recipe for the whipping cream which i used. *Post first published on August 25th 2014. Updated with recipe. Happy to follow you on blogger and facebook. thats so yumm and awewome picture! Super smooth and so creamy. Beautiful clicks and the icecream looks delicious. 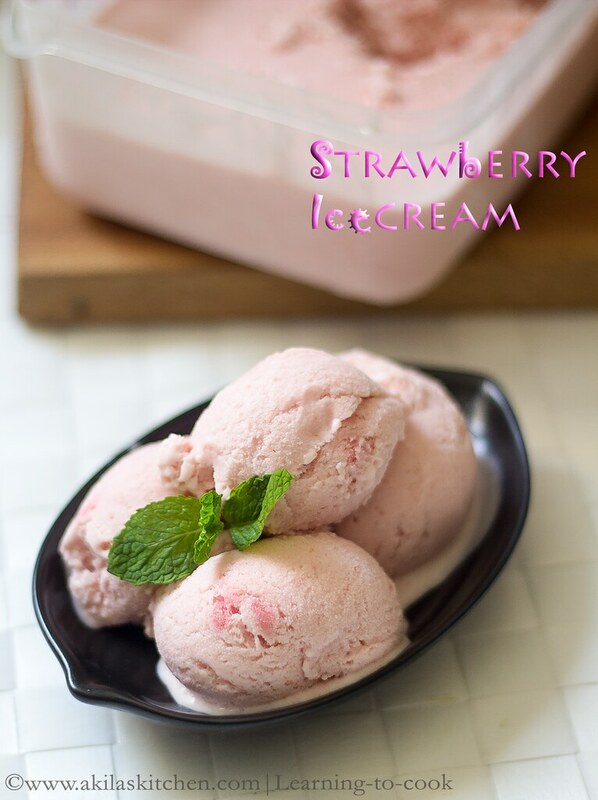 wow, lovely color of strawberries and love the idea of making it without ice cream maker. Love the icecream Akila ,icecream looks like little rose .Have a doubt .Dont we need to mix them up for every half an hour ?I tried some icecream and i was doing that almost 4-5 times for the whole freezing time .